I recently had the privilege of spending a month leisurely and idly travelling through the southern half of the Park in the company of my wife and, for a few days, friends.With the exception of the Pretoriuskop area, all sections of the Park between the Olifants and Crocodile rivers accessible to tourists, were extensively travelled. The very favourable response of the vegetation following widespread rains from the latter half of December until early February, together with good but more localised showers during the latter parts of the wet season – even a good shower in the southern extremes during mid-May, were clearly evident in the wake of the deep drought experienced during the 2015/16 season and first half of the 2016 summer. The grass cover was particularly rank over most areas, with a high degree of prolonged greenness of large areas that benefitted from the late rains. Similarly, most deciduous woody plants were still in full leaf and early autumn shades mainly restricted to the Combretum apiculatum communities south of the Sabie River. Visibility for game-viewing was generally limited. No particular effort was made to analyse elephant breeding herds as for my report of September 2015. However, wherever the opportunity did arise rough counts of immature animals (juveniles and sub-adults up to 10 years of age) and adults were made. Given the lush and dense vegetation conditions a bias in favour of the adults was probable. However, even under these conditions, the percentages of immatures in the breeding herds were estimated to be between 45% and 60%, reflecting almost entirely the same proportion as the more accurate counts of the previous survey. What was astounding was also the numbers of breeding herds encountered. With extremely few exceptions, at least one and more likely more, breeding herds were seen on virtually every game drive and at any time of the day. On one drive between Orpen and Satara a total of eight (8) breeding herds were counted, on a late afternoon drive from Afsaal and down the upper leg of the road along the Biyamiti watercourse to the weir a total of six (6) and from Lower Sabie via the Nhlowa road to Vurhami and back five (5). To suggest that the elephant population has stabilised, that the recruitment rate has been decreased due to the closure of artificial water resources or that it is now in perpetual harmony with other ecosystem components is ludicrous. The last attempted elephant census, which has been ridiculed due to various fatal flaws, was undertaken in 2016. Is a repeat census, with a greater emphasis on accuracy/precision planned for this year, or on any regular monitoring basis in the future? If not, why not? Please read this in conjunction with the report submitted to Research and Wildlife Management divisions in July 2016 (KRUGER NATIONAL PARK ELEPHANT POPULATION, current situation and management considerations). Probably the most perplexing observation during the visit was the scarcity of buffalo herds. No more than eight herds were encountered, the last 0.5 km from the entrance gate at Orpen (technically outside the KNP). 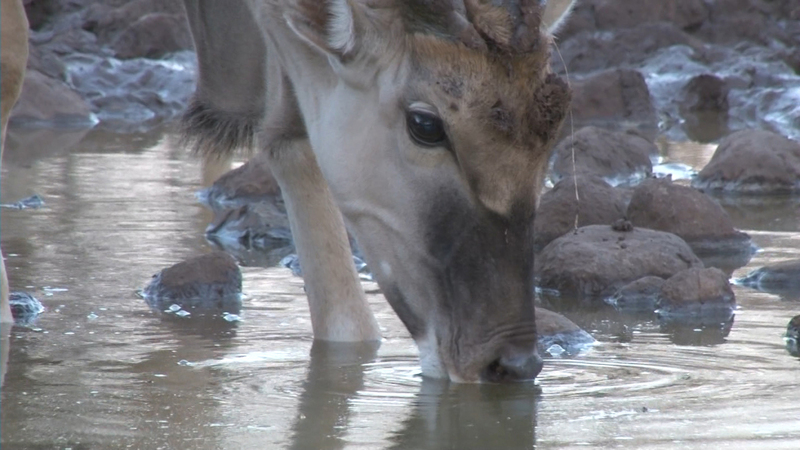 The largest, of about 300, was at Gezantombi waterhole, the smallest 30. Two other of the 8 herds were also seen at Gezantombi, one of 54 (counted) and the other about 180. The latter two may well have been (probably were) part of the herd of 300. Buffalo herd road crossings are generally quite easily discernable, but even these were conspicuously few. There now appears to be a strong movement towards the culling of buffalo, with a strong perception that this will be to provide local communities with meat. Whatever the underlying motive to reinstitute buffalo culling, the scarcity of breeding herds should be addressed. It may be that the herds were primarily missed due to the widespread and very favourable environmental conditions. It may also be that the drought accounted for far more than generally thought. Whatever, it would be unprofessional and poor wildlife management practice to embark on any population control exercise without a thorough investigation of the current status of the buffalo population. In fact, in pursuing a management programme aimed at letting natural fluxes and processes take their course a clear understanding of the effects and impacts of the drought would be a priority of the highest order. Especially as the intensity of the drought has been shown to have exceeded that of 1991/92 in many respects. For this reason, is an intensive census of all the larger herbivores being planned for this year and at least annually in future? Acacia nigrescens is arguably the most important woody plant in the Kruger Park ecosystems. It is highly nutritious, selectively browsed by all browsers, from duiker to giraffe, and provides primary nesting sites for at least four of the KNP vulture species and several of the larger raptors, some of which are threatened/endangered. Acacia nigrescens grow in stands of both tree and shrub form on the dark clay soils derived from dolerite, basalt and gabbro. The stands of the shrub/small tree form provide the preferred nesting sites of vast colonies of Red-billed queleas and Wattled starlings (in addition to several other lower density species). The large colonies of especially queleas, but also the starlings, create a rich and intricate network of predators (e.g. cats, reptiles, raptors). In all its different forms A nigrescens contributes significantly to the biodiversity of the KNP. In 2010 concern was expressed to Dr Sam Ferreira concerning the damage that was being done to several stands of A nigrescens, in particular along the Crocodile River (the KNP was without a botanist at the time). He agreed, saying that the Crocodile River-area had been identified as a problem area and gave the assurance that measures were being considered to address the problem. During the current visit to the KNP time was spent at Malelane, Biyamiti and Lower Sabie rest camps. The impact on the stands of A nigrescens treesalong the Crocodile River, and adjoining areas, can only be described as devastation. Without questioning anyone, I seriously doubt whether any efforts were done to alleviate the situation, as assured (in 2010!). This level of impact on A nigrescens is not restricted to the Crocodile River but is widespread throughout the Park on the soils referred to above. There is a paper, by Viljoen (1988) a former botanist of the KNP, which details the decline of large trees, primarily A nigrescens and Sclerocarya birrea, between 1940 and 1981, as determined from Trig Survey aerial photographs and KNP aerial photo transects, in two areas of the eastern basalt plains, i.e. Guweni, south-east of Satara, and Makhohlolo, between Lower Sabie and Crocodile Bridge. In the former area the decline was in the order of 80% and in the latter 50%. Declines from the 1940’s to 1965 were relatively low (24.7% and 9.4% respectively) while sharp declines were recorded from 1965 to 1981, and the eventual decline between the early 1940’s to 1981 determined at 82.2% and 49.6% respectively. The declines referred to above were severe and probably primarily elephant induced. The eastern plains between Lower Sabie and Crocodile Bridge have now been transformed into little more than scrub savanna dotted with few large trees mainly ingored by elephants (Combetum imberbe, Diospyros mespiliformis, Schotia brachypetala, Philenoptera violacea). In the light of the above and the important role played by A nigrescens in maintaining biodiversity it is strongly recommended that the KNP botanist, or whoever is responsible (Dr Izak Smit? ), repeat the assessments done by Viljoen to record the trends between 1981 and 2017. It is to be regretted that this was not done in the interim period but should now be a priority of the highest order. Incidentally, due to the undulating nature of large parts of the Southern District, large trees stand out on the sky-line between adjoining ridges. During our visit I took photographs from two waypoints from which repeat pics can be taken (fixed-point photography) and from which the demise, or otherwise, of the large-tree component may be gauged! Would be great to identify the trees on the pics.